It is generally believed that the first Christmas tree was of German origin dating from the time of St. Boniface, English missionary to Germany in the 8th century. He replaced the sacrifices to the Norse god Odin’s sacred oak — some say it was Thor‘s Thunder Oak — by a fir tree adorned in tribute to the Christ child. The legend is told that Boniface found a group of “pagans” preparing to sacrifice a boy near an oak tree near Lower Hesse, Germany. He cut down the oak tree with a single stroke of his ax and stopped the sacrifice. A small fir tree sprang up in place of the oak. He told the pagans that this was the “tree of life” and stood for Christ. A legend began to circulate in the early Middle Ages that when Jesus was born in the dead of winter, all the trees throughout the world shook off their ice and snow to produced new shoots of green. The medieval Church would decorate outdoor fir trees, known as “paradise trees,” with apples on Christmas Eve. They called it “Adam and Eve Day” and celebrated with a play. During Renaissance times there are records that trees were being used as symbols for Christians first in the Latvian capital of Riga in 1510. The story goes that it was attended by men wearing black hats in front of the House of Blackheads in the Town Hall Square, who following a ceremony burnt the tree. But whether it was for Christmas or Ash Wednesday is still debated. I’ve stood in that very square myself in the Winter, surrounded by snow. For this is indeed the greatest gift, which far exceeds all else that God has created. Yet we believe so sluggishly, even though the angels proclaim and preach and sing, and their lovely song sums up the whole Christian faith, for “Glory to God in the highest” is the very heart of worship. Returning to his home after a walk one winter night, the story goes; Luther tried unsuccessfully to describe to his family the beauty of the starry night glittering through the trees. Instead, he went out and cut down a small fir tree and put lighted candles upon it. In a manuscript dated 1605 a merchant in Strasbourg, Germany (at that time) wrote that at Christmas they set up fir trees in the parlors and “hang thereon roses cut out of paper of many colors, apples, wafers, spangle-gold and sugar…” Though the selling of Christmas trees is mentioned back to the mid-1500s in Strasbourg, the custom of decorating the trees may have developed from the medieval Paradise Play. This play was a favorite during the Advent season because it ended with the promise of a Savior. The action in the play centered around a fir tree hung with apples. In the middle of the room stood an immense tub with a yew tree placed in it, from the branches of which hung bunches of sweetmeats, almonds, and raisins in papers, fruits and toys, most tastefully arranged, and the whole illuminated by small wax candles. After the company had walked around and admired the tree, each child obtained a portion of the sweets which it bore together with a toy and then all returned home, quite delighted. 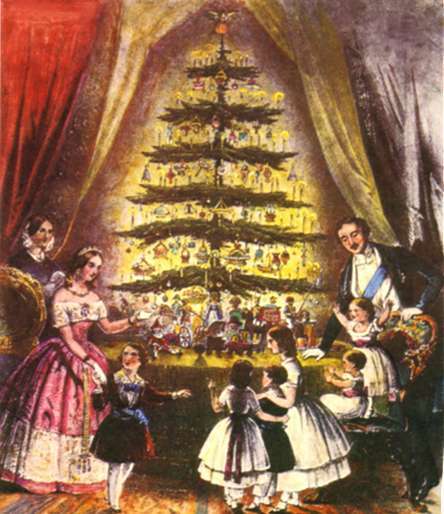 The Christmas Tree was most popularized in England by the German Prince Albert soon after his marriage to Queen Victoria. 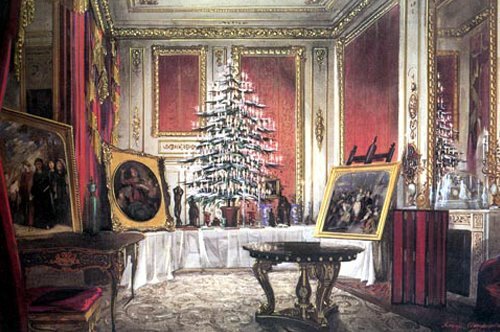 In 1841, he began the custom of decorating a large tree in Windsor Castle. In 1848, a print showing the Royal couple with their children was published in the “Illustrated London News.” Albert gave trees to Army barracks and imitation followed. From this time onwards, the popularity of decorated fir trees spread beyond Royal circles and throughout British society. Even Charles Dickens referred to the Christmas tree as that “new German toy.” German immigrants brought the custom to the United States, and tree decorating is recorded back to 1747 in Bethlehem, Pennsylvania. Many communities vie for the honor of having decorated the first Christmas tree in America. One story tells of Hessian (German) soldiers who fought for King George III in the Revolutionary War. As they were keeping Christmas in Trenton, New Jersey around a decorated tree, they left their posts unguarded. George Washington and his troops were hungry and freezing at Valley Forge, but they planned their attack with the knowledge that the Hessians would be celebrating and thus would not be as able to defend themselves. Christmas trees really became quite popular in the United States following the invention of the electric light. In 1895, President Grover Cleveland decorated the tree at the White House with electric Lights. This idea caught on and spread across the country. The first Christmas tree was a tree representing the Garden of Eden and it was put up on Dec. 24, the feast of Adam and Eve. That’s why people put apples on it. Christians came along and put lights on it. Thanks for your comment Arlene. Though not canonized or made official in the Western church, the Eastern church has long observed the Feast of Adam and Eve on December 24. The Paradise Tree, reminiscent of the Paradise play — popular during the days of the medieval mystery plays — was often decorated with apples to signify the Tree of the Knowledge of Good and Evil while wafers or cookies signified the Tree of Life from the Garden of Eden. Strong tradition of this goes back to 16th century Germany, especially the Alsace region. In Bavaria today Germans still hang apples on their trees and refer to them as Paradise Trees.